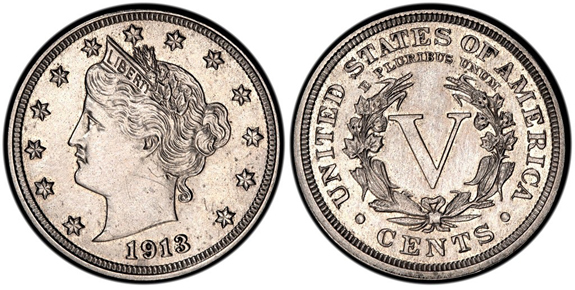 This design was retired in 1912 in favor of the new Indian Head Nickel design and so no 1913 Liberty Head Nickels should have been produced. However, the dies (casts used to strike coins) had already been made and five nickels with the Liberty Head design were struck. A coin collector named Samuel Brown — who coincidentally had been an employee of the U.S. Mint in 1913 — announced at the American Numismatic Association’s annual convention that he had all five. In 1924, Brown sold his nickels to a dealer. Over the years, they passed between dealers and collectors and, in 1996, one of Brown’s Liberty Head Nickels became the first U.S. coin to command more than $1,000,000 at auction. Currently, all five of the nickels are in the hands of private collectors; one especially fine specimen sold for more than $3,000,000 this year! 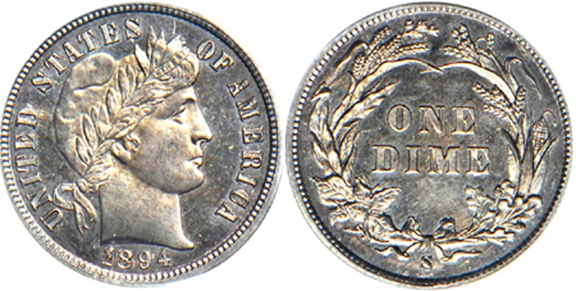 With an original mintage of just 24 pieces — all struck as proofs — the 1894-S Barber Dime is one of the most valuable pieces of American coinage. What’s strange is that the San Francisco Mint (designated by the “S” in the coin’s name) didn’t typically produce proof coins, a job that was handled by the main mint in Philadelphia. And while we may never know the full story of how or why these dimes were minted, what we do know is that the finest examples of these mysterious ten-cent pieces can sell for upwards of $1,000,000. 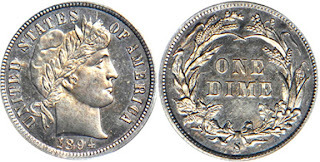 The 1804 Draped Bust Silver Dollar came into being as a result of politics. In 1834, Andrew Jackson’s administration wanted to give sets of United States coinage to visiting foreign dignitaries. The problem was that silver dollars hadn’t been minted for 30 years. The administration’s solution: press eight silver dollars for the occasion and stamp them with the year 1804, making them the only dollar coins to ever bear that year. Today, each of these rarities is worth more than $1,000,000. Times were tough in America in 1933: the Great Depression had taken quite a toll on the country, and there were few signs of the economic upturn everyone was waiting for. With the economy in such dire straits, President Franklin Delano Roosevelt recalled all gold coins and ordered the new 1933 series of coins to be melted down. However, a few of the famed 1933 Saint-Gaudens Double Eagles made their way out of the mint and into the hands of private collectors, most notably a Philadelphia jeweler by the name of Israel Switt who ended up with 19 of them. In 2002, one of Switt’s former coins was sold at auction for $6.6 million, which is not too bad for a coin with a face value of $20! After the secession of Louisiana in January of 1861, the United States Mint in New Orleans passed into the hands of the Confederacy. Lacking the necessary metal reserves to produce coinage, the Confederacy chose to issue paper money instead. 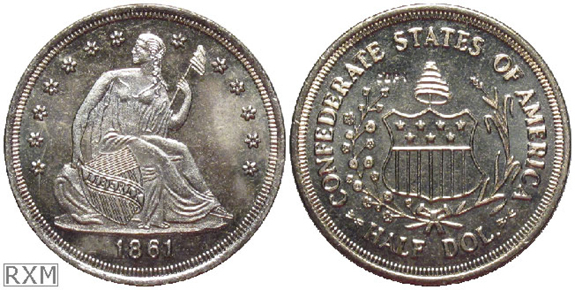 However, there were four known test strikings of Confederate half-dollars that eventually made their way into the hands of private collectors. Today, one of the four is in the collection of the American Numismatic Society, while the other three are in private collections. Because of its rarity, the genuine coin is essentially priceless; even the 1879 restrikes of this famous coin can go for close to $10,000. I've been looking for rare coins in Cincinnati, I don't think I'll be able to afford any of these though! I feel like all of these coins would have a nice heavy feeling when you hold them in your hand! The 1933 Saint-Gaudens double eagle gold coin definitely looks the most attractive in my opinion. I just can't believe that they got $6.6 million for that coin in an auction! Beautiful coin. For years I collect coins. 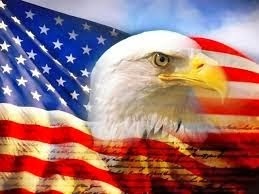 Every time I find a new pervasive nature I crawled here this http://metaldetectorstar.com/ site. It helps me to determine which way to evaluate them.